Justify, trained by Bob Baffert, now heads to Belmont as a Triple Crown contender. BALTIMORE — First the rain, then the fog and finally the greatness. Hooked in a nose-to-nose duel all the way around the track with his primary rival Good Magic, Kentucky Derby winner Justify held on to win the 143rd Preakness on Saturday and will head to the Belmont Stakes on June 9 with a chance to become horse racing’s 13th Triple Crown winner. Unlike his romp through the Derby, Justify had to gut this one out in the slop, finally putting away from Good Magic in deep stretch but also having to hold off Bravazo, who charged late but came up a neck short. Tenfold was a fast-closing third. Trainer Bob Baffert, who also trained 2015 Triple Crown winner American Pharoah, won his 14th classic race, tying D. Wayne Lukas for most all-time. Justify #7 ridden by jockey Mike Smith wins the 143rd running of the Preakness Stakes at Pimlico Race Course on May 19, 2018 in Baltimore, Maryland. 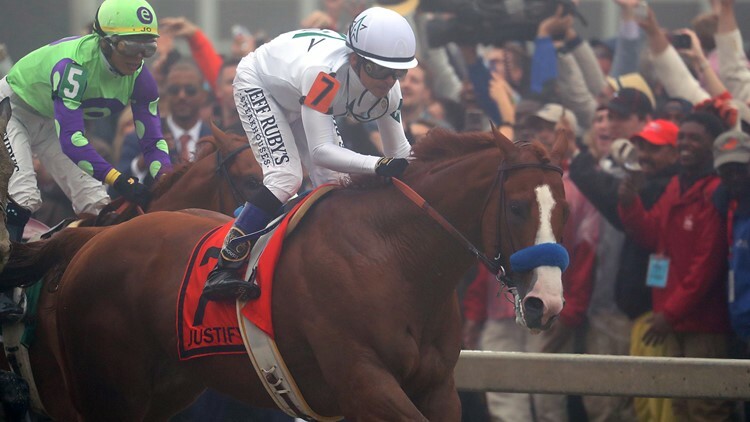 All week, the race shaped up as a coronation for Justify, who won the Kentucky Derby by a convincing 2 1/2 lengths and drew immediate comparisons to the likes of American Pharoah and Seattle Slew, the only horse to win the Triple Crown with an undefeated record. That Justify, a unique physical specimen with blazing early speed, was able to win the Derby at all off just three career races in 77 days, was not only an impressive training feat by Baffert but a testament to the horse’s immense talent. And for many bettors, who made Justify a massive 2-to-5 favorite at post time, there was an air of expectation that Justify would likely duplicate that effort in the Preakness against a smaller field and head to Belmont with a chance to win the Triple Crown, just as Baffert’s four previous Kentucky Derby winners had done. But there were two big questions Justify had to answer at Pimlico. The first was whether a heel bruise that surfaced after the Derby was indeed a non-issue, as Baffert consistently maintained, or perhaps that kind of small physical problem that gets magnified under the grueling Triple Crown schedule. The second issue was whether Justify’s form might simply regress running for the fifth time in a 91-day span, a fairly heavy workload for horses in the modern era. Those possibilities inspired trainer Chad Brown to give Good Magic another chance after he ran a solid second in the Derby and for D. Wayne Lukas to believe Bravazo, after a troubled sixth in Louisville, could possibly serve as a spoiler in a smaller field. And, as always, the Preakness attracted some Triple Crown newcomers like Quip and Tenfold to see how they stacked up against a Derby winner. 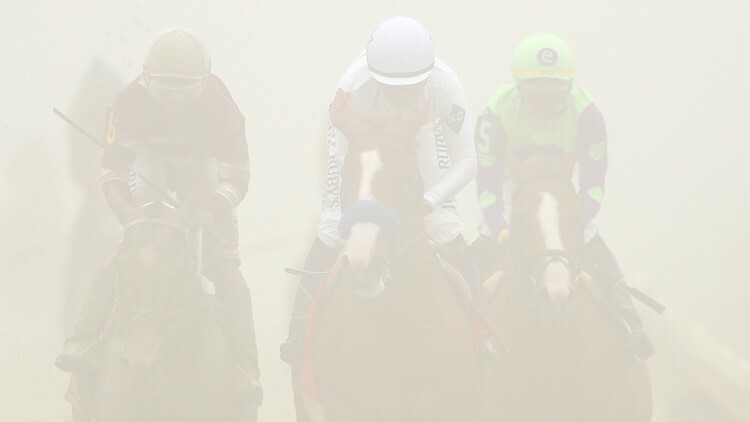 Much like the Kentucky Derby two weeks ago, the Preakness was a dripping wet mess. A seemingly never-ending storm front dumped rain over the area for five straight days, which are particularly challenging conditions at a place like Pimlico, which is 143 years old and now the focus of a fight between its owners and the state of Maryland about whether the race will be moved to a more modern track just south of Baltimore or whether the local government will step up and spend hundreds of millions to rebuild Pimlico. Still, the track said 134,487 people showed up Saturday, many of whom seemed to be enjoying the mosh pit of mud and modern music emanating from the infield without any regard for the racing conditions, which were awful. The track was so wet, Pimlico was forced to move five of the six scheduled grass races Saturday to dirt and worked around-the-clock in the days leading up to the Preakness to drain water off the course so that it wouldn’t pool along the rail. Then, when the rain finally lifted on Saturday afternoon, it left a heavy fog in its place that made it practically impossible for fans to see the backstretch. When the horses finally emerged into view, Justify had been through a full mile of a head-to-head duel with Good Magic, a battle that clearly tired both horses. Still, Justify had enough to win -- and now stands just 1 1/2 miles away from history.